Preferred IT Solutions can create a neat and reliable network infrastructure for your voice and data connections. By creating a cable management system, you can best prepare for shifts in technology and user requirements. 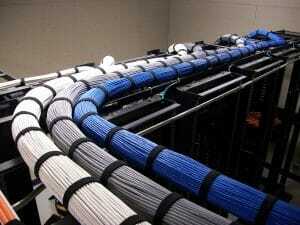 A typical structure cabling project runs voice and data cables through the walls or ceilings of your facility. The cables connect to individual workstations at one end and terminate at patch panels in your server room and telephone closet. Preferred IT Solutions can create neat pathways and label cables so you can easily identify problems if they emerge. When a project is complete, wiring and components are tested to ensure that each location has a fast and clear connection to your network. Whether you’re moving into a new office, gutting and rewiring an existing office, or expanding to accommodate growth, Preferred IT Solutions can ensure that your network is up and running from day one. We specialize in Data and Voice Cabling, whether you need one CAT6 cable run or an entire office networked, there is no job we can’t handle.